Rodrigo Ramirez Pimentel, who commonly goes only by Pimentel, is a very talented artist from Michoacan, the Mexican state that marks the birthplace of such greats as Alfredo Zalce and Juan Torres. Born in the town of Zinaparo on September 6th, 1945. He was a student at the important Academia de San Carlos in Mexico City. His paintings bring to life pre-Columbian myths that are deeply rooted in Mexican culture. His work shows the influence of Jose Clemente Orozco with blends of Pop Art. 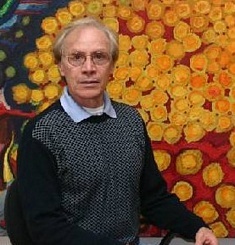 His paintings are part of important collections such as the Museo de Arte Moderno in Mexico City, Museo Amparo in Puebla, MARCO in Monterrey, Museo de Arte in Queretaro, Museo de Secretaria de Hacienda in Mexico City and Deutsche Brotmuseum in Ulm, Germany. Perhaps his most famous work is the mural at the Restaurant del Lago in Mexico City.